The Stahli Model DLM 700 flat-honing machine’s simultaneous top-and-bottom finishing of carbide inserts expands Spartan Carbide’s production capabilities. For more than 30 years, Spartan Carbide Inc. has provided high precision carbide inserts and tooling. Spartan Carbide specializes in form grinding of specials and standard geometry ceramic, PCD and CBN inserts for diverse OEMs. In 2002, Spartan combined two existing facilities that separately housed management and manufacturing into one facility in Fraser, Mich.
END USER: Spartan Carbide Inc.
More than 98 percent of the inserts Spartan produces have a top-and-bottom grind, which delivers the flatness, finish and parallelism its customers specify. To accomplish this, Spartan had seven single-sided rotary-table grinders operating 10-hour shifts, 5 days a week. According to Haberski, he could expect 900 to 1,000 inserts from each of the rotary table grinders in a 10-hour shift. 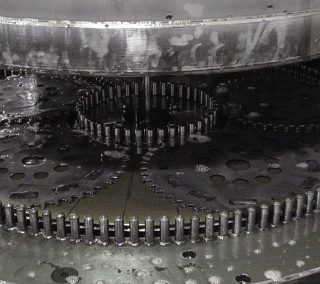 “It was a very labor intensive operation,” continued Haberski, “requiring one operator per machine to achieve that level of production.” Setup was also time consuming because the inserts needing to be positioned in a 30″ magnetic chuck with a 2″ ring, as well as positioned in several smaller steel straps to lock the carbide inserts into the 30″ chuck. The initial grinding on the single-sided rotary-table grinders was critical to Spartan’s overall production as the machines’ output fed more than 40 grinders used for a secondary operation: finishing the peripheries and edges of the inserts. Being single-sided abrasive machines, the inserts had to be ground first on one side then flipped and ground on the opposite side. This required multiple setups. According to Haberski, a batch of inserts often had to be flipped a third time to achieve the appropriate degree of parallelism, further clogging production. Prior to consolidating facilities a year and a half ago, Spartan was introduced to Wauconda, Il.-based Stahli USA’s flat-honing process by Ray Nixon, principal of R.F. Nixon Associates, Ortonville, Mich., the local Stahli distributor. “We have worked with Ray for years,” noted Haberski, “and he has become extremely familiar with our operation.” With Nixon’s assistance, Spartan began to research how the Stahli process could provide the additional capabilities required to increase productivity and streamline the initial grinding process. Haberski and Spartan principal Onorio Catenacci visited a production facility in South Carolina where multiple Stahli machines were in operation. They chose a Stahli Model DLM 700 flat-honing machine with simultaneous top-and-bottom finishing to expand Spartan’s production capabilities while delivering both the volume and overall finish quality required to eliminate the bottleneck in that process. The Stahli flat-honing, or fine-grinding, process is unlike conventional fixed-abrasive grinding or lapping for sizing workpiece’s. Flat lapping, as opposed to flat honing, typically involves a slurry of loose aluminum oxide, silicon carbide or other abrasive grains flowed across a rotating lapping plate in a water or oil-based solution. By creating an abrasive “film” between the plates and the workpiece, stock removal from a single side, or both sides simultaneously, can be accomplished without part distortion due to heat or clamping. The Stahli DLM series replaces the loose abrasives with bonded conventional, CBN or diamond particles in fixed abrasive wheels. This produces the same precision with stock-removal rates 10 to 20 times faster than traditional flat lapping. For carbide applications, stock removal of 0.015″ to 0.020″ can be accomplished simultaneously on both sides in 4 to 5 minutes. The inserts are held in five carriers made of fiberglass or steel. The carriers automatically index into the five positions on the Stahli DLM 700 table. The operator can load inserts into the next set of carriers while the machine is cycling. At Spartan, the operator can unload the finished inserts from the machine and start processing a new batch within 2 minutes. The parameters of each component’s requirements are programmed and stored in a Windows-based PC. According to Haberski, this enables a quick response to part changes and easily accommodates smaller batches as well. Haberski said the flat-honing machine accommodates all of Spartan’s insert sizes, which range from 0.160″ in-scribed circle by 0.094″ thick to 4″ diameter by 0.500″ thick. The Stahli consistently holds tolerances of ±0.0001″ and stops automatically when preset finish sizes are reached. In addition to the Stahli DLM 700, Spartan incorporated a Transor 1µm filter, as the coolant is a low-viscosity honing oil, as well as a chiller that provides plate cooling. Haberski noted that these two components have improved overall productivity and product finishes. The payoff for Spartan has been an increase in overall production while eliminating the bottleneck. The Stahli DLM 700 produces 4,000 to 5,000 inserts in a 10-hour shift compared to the 900 to 1,000 on the single-sided grinding machines. This enabled five of the seven single-sided grinders to be taken offline and sold prior to relocating to the new facility. The Stahli DLM 700’s simultaneous two-sided grinding, along with fewer setups, gives Spartan significant productivity enhancements with consistent yields. Because the flat-honing machine has been so productive, Spartan is bringing in outside contract work to fully utilize the machine’s capacity.